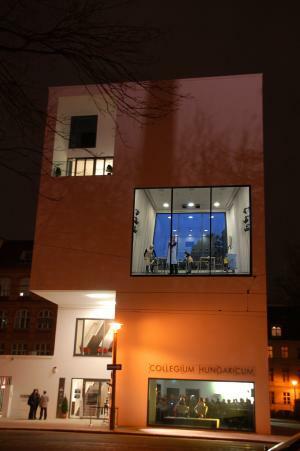 Since november 2007 the Hungarian culture institute Collegium Hungaricum Berlin (CHB) has its home at Dorotheenstraße 12, behind the Humboldt University, with a view on the boulevard “Unter den Linden”. A location in the middle of the historic centre of Berlin, right next to the “Museum Island”. This modern building in a neo-Bauhaus style, designed by Peter P. plays with its façade with “laminarity” and contrast. It includes a 40 m² large panorama window with a rear projection. The ground floor room behind the 15 m² large front window communicates with the public space as well. 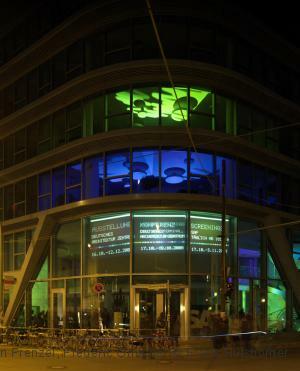 Wall Terminal, The Multi Media City Terminal: These terminals are part of a network of 64 public Bluespot online city information terminals incorporating two illuminated posters and a touch-screen monitor, dispersed near Berlin’s main tourist attractions. For the festival, one particular terminal will provide an interactive link with the CHB media facade. The office building is located at Rosenthaler Straße 30, in the heart of the vibrant tourist centre of central Berlin. The media facade consists of various linked digital elements and invites interaction with sound, movement and touch. The projections behind the glass facade will especially become visible at dark and establish a relationship between the inside and the outside of the building. 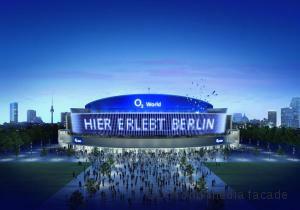 O2 World, Mühlenstrasse 12-30 – The Giant Screen: The crescent shaped glazed front with a total area of more than 1,440 m2, incorporating 300,000 LED’s of the Arena is probably one of the largest outdoor media installations world-wide. It overlooks a large square with ample public space and faces the river Spree. Three loosely dispersed large format LED screens operate as guidance system and advertising space. The event hall is part of the 180 hectare urban development area “Mediaspree”, which currently is to be transformed into an urban media- and service district. Converted industrial and commercial buildings that are so characteristic of Berlin lie at the banks of the river. The East Side Park is being developed by the district beside the hall – part of the memorial concept of the Berlin Wall. 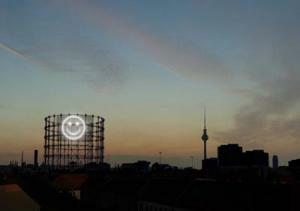 The Nightscreen-Gasometer is located in the south of Berlin. With an expanse of 660m² it is Europe’s biggest LED media facade. The LED net is attached to two top rings of the steel frame in an altitude of 80m, visible far beyond the Schöneberg district at nighttime. 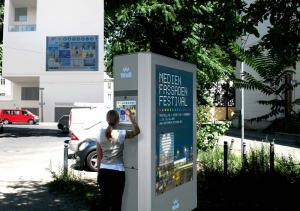 The orientation of the screen, operated by Megaposter, mainly is directed towards the city motorway interchange connected to the new regional and intercity railway station Berlin Südkreuz of the Berlin Circle Line (Ringbahn). The listed Gasometer building is located in the Südkreuz area of the development programme “Urban Redevelopment Project West”, financed by the Federal and State governments. The steel construction can be seen from far away and is the landmark and striking symbol of the Schöneberg district. It is located in the former industrial estate of the Gasag among various railway tracks in the Rote Insel (Red Island) neighbourhood. The plan is to transform the Gasag-estate into a “European Energy Forum” with shops and office buildings, hotels, restaurants, a private university and a park.